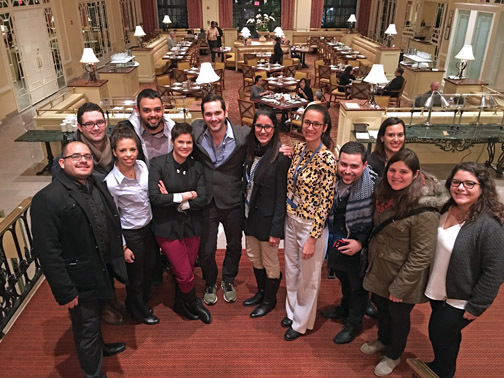 Some of the participants in the Yale Ciencia Academy program, from left: Kristian Saied, Ariel Negrón, Ivelisse Cruz, Kelvin Quiñones, Mónica Feliú-Mojer (YCA coordinator), Luis Quevedo (YCA facilitator), Leslie Díaz, Edith Brignoni, Omar Vélez, Raura Doreste, Rosa Martínez and Ana Vaquer. Nonprofit organization Ciencia Puerto Rico (CienciaPR) is making a call for applications to the Yale Ciencia Academy, a program to transform the training of young scientists in Puerto Rico and the U.S mainland. YCA is a collaboration between CienciaPR and Yale University and is funded by the National Institutes of Health. The program leverages the CienciaPR community — the largest network of Puerto Rican scientists in the world — to connect to doctoral students in biological, biomedical, health and behavioral sciences with advisors, mentors and professional development opportunities. Through workshops and virtual conversations with successful scientists, participants can explore different careers; define their academic and career goals; expand their networks; and acquire communication and leadership skills. The program also allows students to have an impact on society through science outreach. In addition, participants attend an in-person meeting at the annual conference of the American Association for the Advancement of Science, the world’s largest scientific organization. The program responds to the need for young scientists to better orient themselves about career opportunities and how to be more competitive in academic careers and other sectors, said CienciaPR Executive Director Giovanna Guerrero-Medina, who also heads the project. “Students from Latino/Hispanic and other groups underrepresented in science students often do not have access to professional mentoring and support networks to help them accelerate their careers. Through this program, we leverage the wealth of talent and experience we have in CienciaPR to ensure that students are better prepared to achieve their career goals and have an impact on society,” said Guerrero-Medina. In 2016, the program has 34 Puerto Rican and Latino participants who are pursuing doctoral studies in 21 universities in Puerto Rico and the U.S. mainland. Applications for the Yale Ciencia Academy are open until Nov. 23, 2016. Students can submit their application through www.cienciapr.org/yca. About 40 students will be selected to participate in the second year of the program, beginning January 2017. Hey Buddy!, I found this information for you: "CienciaPR opens call for Yale Ciencia Academy program". Here is the website link: https://newsismybusiness.com/cienciapr-ciencia-academy/. Thank you.